I know this may sound peculiar, but I'm really picky about aprons. I've tried all kinds. Some are too stiff and heavy. Some are too lightweight. Some don't have pockets. Some don't have pockets in convenient places, or in useful sizes. All the aprons I've ever had until this one have a strap that goes around the neck. I didn't realize that this was annoying until I purchased the apron you see here. Its straps crisscross behind your back. No rubbing against the neck, no weight on the neck if you have something heavy in a pocket. As you can see, I have a habit of swiping my brush against the apron. One that is too narrow means that I miss and end up with paint on my pants. 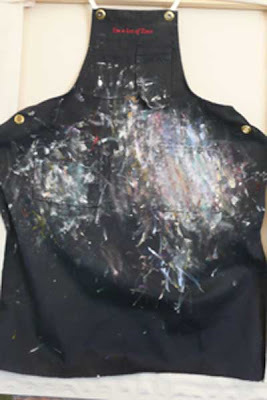 This one is nice and long, so if I brush against wet paint, it goes on the apron, not my clothes. Yet it's not so long that I trip over it. Now, you must be wondering where I got this fabulous item. Well, I stumbled on it at the shop in the printmaking studio at Crown Point Press . If I could afford it, I'd order a lifetime supply!